With arrival of Summer ,the market looks colorful to me with varieties of Stone-fruits lying around. Red !! Such an eye-catching color .. I picked up a box of cherries while roaming in the Spice-Market of Chandini-chowk,Delhi. With no delay i ate 2-3 piece there itself, it was so fresh,juicy!! 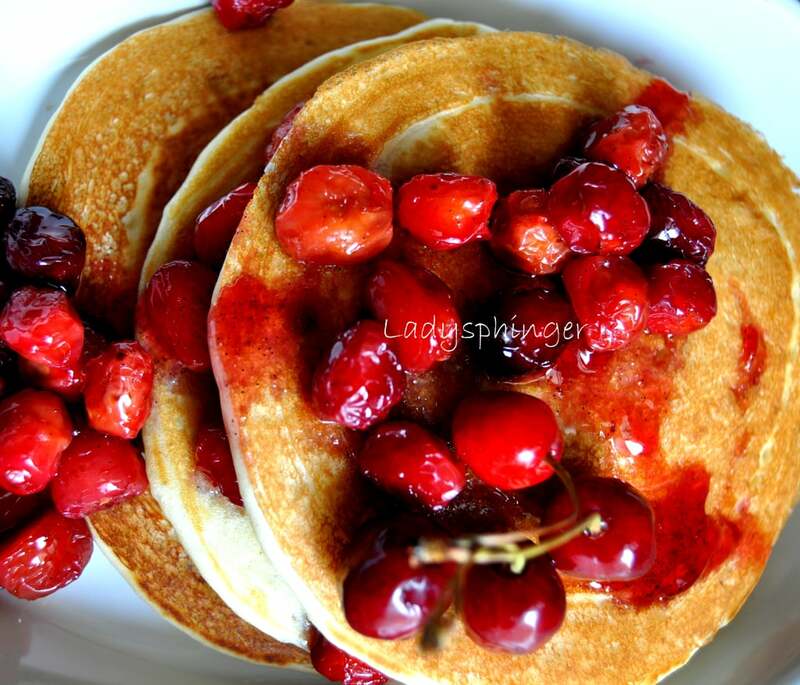 Pancake..An easy breakfast to make out!! Here I am sharing an egg version of it ,And to make it fluffy and soft i have used Soured Milk. Its is also called acidified milk where i have used white vinegar to make it. Add vinegar in the milk and let it stand for 10 minute.Mix all dry ingredients in a bowl. Now after 10 minute over add egg ,vanilla extract and melted butter to the milk-vinegar mixture and whisk it for 5 sec. Mix wet and dry mixture well. Don't over-mix , just be careful that there should be no lump !! Grease a griddle or nonstick pan with cooking spray or a little vegetable oil.Heat pan on medium flame. Pour batter to form pancakes of whatever size you like. Cook first side until bubbles form on top, about three minutes.Flip to the other side and cook till u get a nice light brown color, about two minute. Serve immediately with butter and honey or any fresh-fruit compote.I served with cherry compote.